The Oliver twist trope, but beautifully more complex and adulted. My wife was listening at first and said she knew exactly where the story was headed. So many sharp twists and turns. Exactly what I wanted this book to be! Just finished two and three and thought I would come back and give book 1 some love. I sincerely hope that the narrator of this audiobook got an award for this performance because he really made this book. He did all different voices and accents, and truly made this book even better than it already was. Story was pretty good, but couldn't help thinking it may have been carried a little bit by the narrator. An outstanding story filled with twists and turns to keep you wondering what's around the next corner. I highly recommend it. The content was exceptional; a truly wonderful story woven by the author. The real joy of this is the narrator himself of this audiobook. I listen to a lot of them, and this guy is an absolute gem. Worth the listen on the merits of the narrator alone. One of the best performances in any audiobook I've listened to. The narrator really gives life to the characters and the beautiful prose. However, be warned that the prose might seem overly flowery for some, especially for an audiobook. I have listed to a large number of audiobooks over recent years, many of them of them excellent - however, this is the first time I have been sufficiently motivated to actually write a review. This was just a perfect combination of original story, entertaining witty characters and a wonderful narrator. Michael Page's range and consistency of voices brought the whole thing to life. A slight warning is in order to those of a nervous disposition, however - the story contains occasional graphic descriptions of violence and frequent "colourful" language. It was a great book. Story kept you intrigued the whole time. It's a fascinating mix between The Italian Job / Oceans Eleven / Clever Crime with fantasy and a fascinating city-scape. Now completely hooked on gentleman bastards! I bought this audiobook completely off others recommendation on audible and was really surprised. I'm now completely hooked on this series and am in high anticipation for the release of the third book. As others have said: think fantasy mixed with a dash of oceans 11 with a plot line that is rarely predictable. Great characters but be warned there is a fair bit of violence and swearing - but nothing I found overtly graphic or gratuitous. The narrator is amazing and really hits the tone of the books. Personally I imagine this to be set in something like medieval Venice with its many gangs and political intricacies (with a bit of magic and alchemy thrown in). However Lynch is great at not making these aspects too complicated for his readers/listeners to follow. 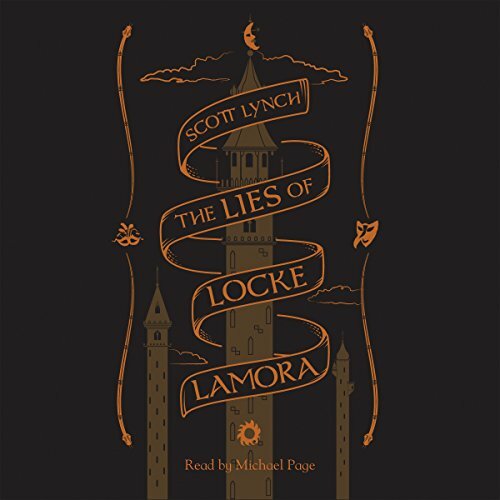 The Lies of Locke Lamora (2006) by Scott Lynch is a suspenseful scam and revenge story set in a colorful and brutal fantasy world, a little like The Sting meets The Revenger's Tragedy in a Joe Abercrombie novel. Locke Lamora is the leader of a gang of seemingly small-time thieves that actually executes complex and high-yield con-schemes utilizing their skills of prevarication and impersonation and targeting the proud nobility of the Italian-esque city-state of Camorr. Locke and his brother-thieves take pride in their talents and scorn their blue-blooded marks--until the Gray King comes to town with his hired Bondsmage and Locke learns what it's like to be caught in the machinations of people who are more devious, powerful, and bloodthirsty than he is. Lynch interweaves throughout this main story compelling short chapters depicting Locke's childhood education and indoctrination into the gang by his surrogate father "Chains." Lynch's fantasy world is a vivid creation, featuring different cultures, languages, and gods, alien artifacts, alchemy, magic, an economy, and a history. But it is populated by unpleasant people: scheming, thieving, insulting, cruel, violent, vengeful, greedy, and power-hungry. And these people spew foul language and references to body-parts, bodily-functions, and prostitutes, until I often felt as if I were watching a desperately gritty crime movie. When Dona Sofia Salvara (an aristocratic alchemist) says, "Don't teach a sailor to s--t in the ocean," it feels excrescent and out of character. And some scenes ring false, as when Locke visits a brothel to seek solace, and some seem tedious, as when he visits a bank to borrow a suit of clothes. After Lynch complicates the initial scam story strand with revenge, I did come to care about Locke and his friends in their predicament. And Lynch does write some rich descriptions that are a pleasure to read/hear, like this: "From the heights of the Five Towers to the obsidian smoothness of the vast glass breakwaters, to the artificial reefs beneath the slate-colored waves, Falselight radiated from every surface and every shard of Elderglass in Camorr." Michael Page does a great job reading the novel, modifying his voice for various accents, genders, ages, and moods so as to vivify the best qualities of the story. And I did mostly enjoy it. And if you like complicated scams, graphic violence, macho banter, foul language, and morally ambiguous fantasy worlds, you should give it a try. I absolutely loved this book. The story just grabs you in from the first moment. I especially loved the fresh approach the author took compared to traditional fantasy writing. There is no dark lord rising, no coming apocalypse, no village boy who finds out he has magic powers and must save the world. It is just the story of Locke and his friends and their (mis)adventures and it is brilliant. The narrator is excellent. I find his voice very easy to listen to and he makes the characters feel so real. I especially loved the way he handled the dialogue, it is full of dry wit and sarcastic one-liners and he delivered them perfectly. My one minor criticism of the story is that there are patches where I feel the author gets bogged down in describing either the architecture of the city or the detailed dialogue involved in their cons. In particular the passages where Locke is dealing with the nobility go overboard in detailing all the social pleasantries and etiquette involved. But being an audiobook, it is easy enough to just sit through these parts until it gets back to the action. Would you consider the audio edition of The Lies of Locke Lamora to be better than the print version? Definately. This is a performance! What other book might you compare The Lies of Locke Lamora to and why? I've never read anything quite like this. It makes me think of the theatre rather than a book. This is my first listen to Michael Page and I love his interpretation. No, but I picked it up whenever I could. A very good read. I'm going to read the next book in the series. The bar is set high now, so I hope Scott Lynch can back it up. This is definitely one of my new favorite books, and one which I will be recommending to all my friends. It was a rare treat in a genre so overstuffed with cliches and boring, predictable books! Scott Lynch has created an elaborate city-scape, stuffed it with neat characters and interesting histories, mixed alchemy, magic and crime, AND woven together several plot threads without ever being boring or getting weighed down by the need to explain unnecessary things. A quick warning, this book isn't for the faint of heart, it's fairly gory in parts and, not to spoil things, but don't get too attached to any given character. The plot of the book moves along quickly, following a gang of con-artist criminals in a city somewhat reminiscent of Venice. Locke is a great hero, with tons of interesting backstory (which we get in very well placed 'interlude's) who also has a reasonable number of flaws. The plot was complex enough to keep you on your toes from start to finish. I see that there are two sequels. The book is certainly written with hints of other potential, future storylines, but they're neither blatant nor obviously added as afterthoughts. You could easily read this book and not need to read the rest. I'm on the fence about reading the next one. I always find that the first book is the best. I hate to tarnish my opinion of a series/author as the following books fail to live up to expectations, but I'll probably give them a try. The narrator was perfectly adequate. I'll admit that he'd narrated another book I've listened to that I didn't particularly enjoy, so my lack of enthusiasm for his performance is probably tainted by that other book. But he grew on me as the book went on. What did you love best about The Lies of Locke Lamora? I really enjoyed the bad guys in this book. I mean Locke was written very well, but the bad guys we're hiatal good. I also liked how the book went from present to past in different chapters.. One chapter would leave you wonder, and a few down the road would explain it all. At first I didn't like it, but once I got into the book I enjoyed it. Oliver Twist.. Which is why I put the hardcover down a couple years ago. Started off very much like Twist, but grows up really quick. Like I said, I'm really glad I gave the book a second chance. Locke for sure.. The spider second.. He put just enough passion into lockes character that by the end you really feel for him like you're supposed to. I think the performer makes this book as good as it is. This is definitely one of the best fantasy books I have read/ listened to ( and I've the read LOTR, Game of Thrones series, Potter Series, most of Wheel of Time and more). The narration is excellent and appropriate for the elaborate world created by Scott Lynch. If your a fan of gritty realism (i.e Game of Thrones), elaborate plots, witty banter and clever characters (i.e Tyrion Lannister/ Matt Cauthon) then you should definitely pick this book/ audio book up. slow. not coherent. got a bunch of chapters in and did not get to the point.